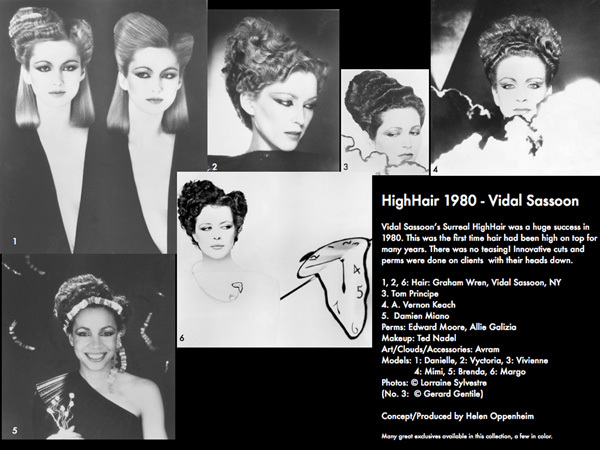 A selection of 6 from a total of 19 photos from Vidal Sassoon’s world-famous HighHair Collection from 1980 with hair by Graham Wren, A. Vernon Keach, Tom Principe, Damien Miano, and Avram who also created the art, background, clouds, Dali watch. This was the first time hair had been high on top for years, and these photos had high impact at the time. No teasing! Concept/Produced by Helen Oppenheim. Photos: Lorraine Sylvestre. For more photos and full credits see Hair/Then, Vidal Sassoon.